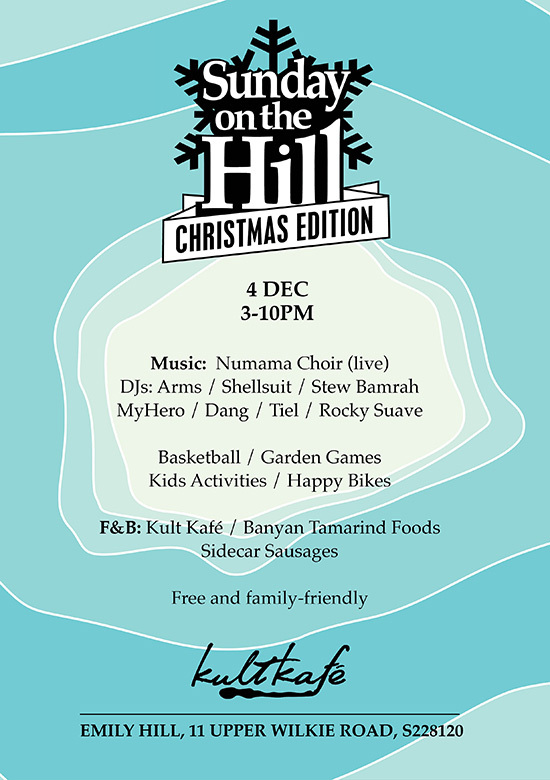 Join us for our final Sunday session on the hill for 2016 – the Christmas edition! Featuring live music from Numama Choir in the early evening, plus DJs Arms, MyHero, Dang, Tiel, Rocky Suave, Shellsuit, and Stew Bamrah on the decks with a selection of their favorite records – old and new. Rain or shine – we’ll have a little dancefloor in the building. F&B by kult kafé, Sidecar Sausages and Banyan Tamarind Foods – reasonably-priced Archipelago craft beers, ciders, cocktails, gourmet sausages and great vegetarian food all day. Happy Bikes https://lovehappybikes.com/ make a welcome return with free balance bike test-rides for kids in the carpark. Basketball, garden games and kids activities going on all day. There will be artworks from Mojoko‘s recent “Psycho Tropics” exhibition and other selected artworks (for sale) at Kult Gallery. As always – free entry and kid and dog friendly! No outside food and drinks please – your custom helps us keep the party rolling. Beat the queue with WAAVE cashless-payment system! Kult Kafe on Emily Hill is only a 6-8 min walk from Wilkie Edge or Little India MRT.